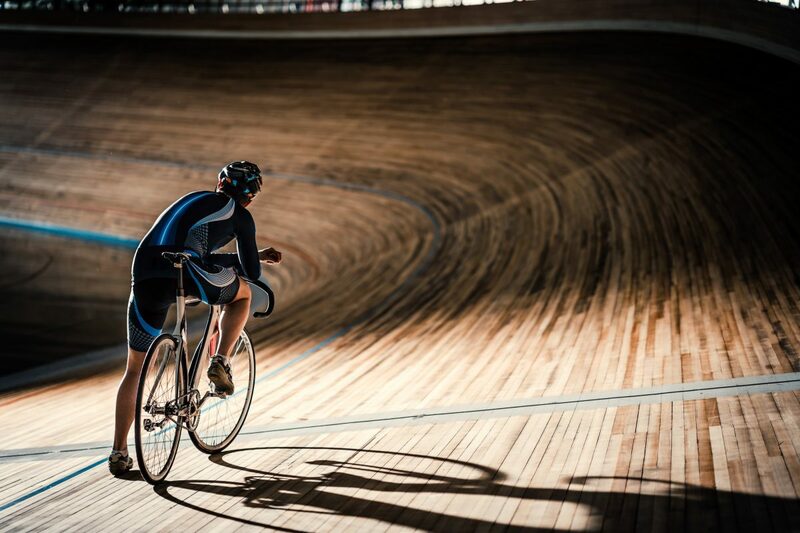 Track cycling is something that riders new to bike riding rarely consider. More often than not they see themselves out on the road – perhaps in a bunch, perhaps solo – pedalling away the hours and clocking up kilometres. Sometimes they see themselves attacking sections of single track with trees whizzing past at breakneck speed and dust rooster tailing behind them. And that is great! Any form of riding is to be applauded. By why not consider a trip to the local velodrome as well? Sure, the bikes are a bit different, and the velodrome can look daunting with its wildly tilting bends, but all in all, track cycling is not that far removed from other forms of the sport to make it completely foreign to the novice. If you can ride a road bike, you can ride a track bike. If you can tackle a twisting single track, you can master the velodrome. The beauty of the track bike lies in its simplicity. There are no gears to adjust and no free wheeling hub to worry about. There are also no brakes to fiddle with. Maintenance is a breeze! A drop of oil on the chain occasionally and a quick wipe down of the frame, and voila, you’re ready for that coffee! Your road bike would never let you get away so easily! But wait, what’s this I hear you ask? No brakes? Isn’t that dangerous? Well no, not really. While racing on the velodrome can be tight, there are no sudden decelerations. No one can hit the brakes and bring the rest of the group down. You can’t even stop pedalling and start coasting because of the fixed wheel, so speed within the group is more constant than in a road peloton. Just imagine it – no nervous brakers to contend with! Although nervous brakers are non-existent on the track, you still have to keep a bit of riding etiquette in mind when flying around the velodrome. Too much pushing in a heated race can lead to crashes, as evidenced by the above clip from the 2017 Men’s Austral Final. Velodromes come in all shapes and sizes. They can be tight, steeply banked 250 metre tracks or flat courses of 400 plus metres built around football grounds. They can be made of wood, concrete or asphalt. They can be indoor or outdoor. Usually they are oval shaped, although Bendigo’s is more like a capital D! 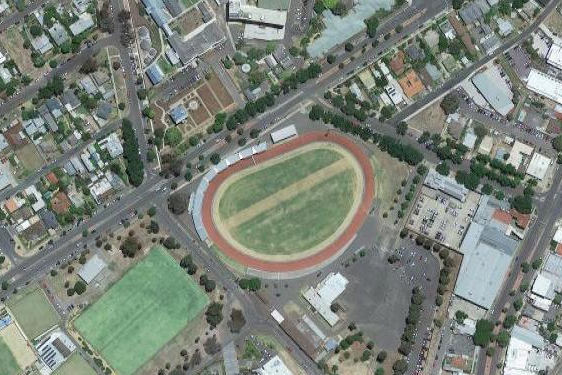 The velodrome at the Tom Flood Sports Sports Centre in Bendigo doesn’t have the typical oval shape you’d expect a velodrome to have. The banking of a 250 metre track is steep. Ballarat’s velodrome tilts at an alarming 37.5 degrees, while the indoor velodromes in Melbourne (DISC and Hisense Arena) are up around 42 degrees. The first time you ride on such a track you can’t help but think your bike is going to slip out from under you (it rarely does), but once you get the hang of it, there is no better feeling! But the best part about riding on a velodrome is that it is free of cars. How good is that? There are no traffic lights either, or stop signs, and (hopefully) no potholes. There is nothing on the velodrome that will slow you down or threaten to kill you! And because you can’t ride on the slippery banking when it is raining, your bike stays pretty clean as well! For the most part, racing on the velodrome is short and sharp. Most races are over within minutes. Even the elite endurance events rarely go longer than an hour. Imagine a road race without the six hours of riding that comes before the sprint. How intense would that be? Well, welcome to track cycling! The number of different types of races that are contested on the track may surprise you too! There are the sprints of course, where two riders go head to head in the ultimate test of who is fastest (and smartest). They start off slow and tactical, then explode in a pedal churning, heart busting, lycra blurring, truly spectacular dash to the line. 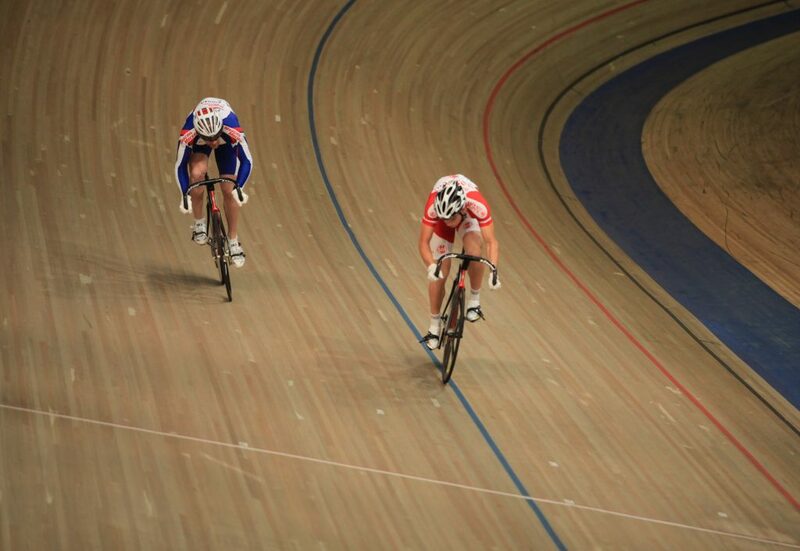 The match sprint is different to the individual pursuit in that two two riders start next to each other for a race to the finish line. The race normally goes for 250 m or 1000 m and is highly tactical, because a drafting rider can conserve energy for a stronger sprint finish. See for yourself at the end of this article! There are team pursuits, where two teams of riders line up on opposite sides of the track and proceed to try and chase each other down over a set distance. The winning team is the one who makes up the most ground on the other. Individual pursuits follow the same concept, except, as the name suggests, only one rider lines up on each side. Elimination races are fun. The last rider across the line on each designated lap is eliminated ensuring everyone has to race, every lap. No bludging. Points races are tough too! Points are awarded on designated laps for the order in which riders cross the line. Not only do you have to concentrate on riding, you have to be good at maths as well! Flying 200 metre time trials are popular, as are 500 metre and 1000 metre timed events. Like in road time trials, there is nowhere to hide. The helter-skelter of the Madison is for advanced students only and involves teams of two riders propelling each other around the track via hand slings. Not for the faint-hearted. Sometimes a cycling club will wheel out an old motor cycle. It is usually a rusty, decrepit thing that may or may not start, but if it does, you can run motor paced events. The keirin is one such event and consists of six to eight riders who are paced by the motorbike for a set distance before it pulls into the infield, leaving the competitors to fight it out to the line. Of course there are also your every day, run of the mill, scratch and handicap events, so there really is something for everyone. But perhaps the biggest advantage track racing has over road riding is the fact that if you get dropped you don’t have to ride the next 200 kilometres by yourself on some windswept, potholed, country back road. You’re already where you need to be! Track season in Australia runs over the summer months and if you are prepared to travel you’ll find somewhere to race almost every weekend from November through to March. In Victoria, the track season goes into a frenzy between Christmas and the New Year. The Christmas carnivals cover four consecutive days of racing and this season they began in Wangaratta and finished in Ballarat. Tasmania run a similar series and I’m guessing the other states may do something as well. Track carnivals cater for all skill levels and age groups and often have up to 40 or 50 events over the course of the day. Each age group or category can expect to race at least three or four times, more if there are heats and finals to contest. While scratch races and wheelraces (handicaps) are the mainstays of most carnivals, any of the events mentioned above can be inserted into the program to add variety. At some of the smaller country carnivals, age divisions or categories may be merged depending on the number of entries. As such, you may find yourself being spat out the back of a group that is faster than what you’re used to, but that’s not necessarily a bad thing, because you’ll get a more lenient mark in the wheel races (handicaps) than your more highly fancied opponents. The wheel races can be fascinating contests, especially at the smaller carnivals where the spread of talent across any particular field can be extreme. With only one or two elite riders, a handful of weekend warrior types and a couple who are only there for the fun of it, riders can be given marks hundreds of metres apart. Watching the elite riders try and chase down the rest of the field is thrilling. This season my family has travelled to Ararat, Melbourne, Wangaratta, Bendigo, Ballarat, Mt. Gambier, Hamilton and Colac to race bikes, and there were many more carnivals we could have attended. Track racing is an exciting, engaging and relatively simple sport to get involved in. It’s fun to ride and fun to watch (you can see the whole track from where ever you’re positioned). Many clubs have track bikes you can borrow and if you do catch the bug and can’t wait for summer, Cycling Victoria run a winter track series at DISC which has proved popular. Grab yourself a fixie and get pedalling. Do I need a fixie to ride on the velodrome? Yes, especially if there are other riders on the velodrome. The last thing they want when whizzing around at high speed is someone impeding their momentum by jumping on the brakes or coasting. Remember, they have no brakes. They can’t come to a sudden stop to avoid smashing into you. It is just too dangerous to mix track and road bikes on the velodrome. Can I rent or borrow a track bike at the velodrome? Yes, although it does depend on where you are. A lot of cycling clubs (even some of the smaller country clubs) will have a collection of track bikes available for members to use. Some clubs may lend the bikes, some may hire them out, either way, you should be able to test one out before rushing out and buying one! Your local cycling club is the best place to start out. Most of them will have access to a velodrome and run some sort of track program. They will also have members who can give you advice and monitor your progress. A lot of clubs will also run ‘come and try’ days where you can see what the fuss is about without any financial outlay. If you do decide you like it and want to give racing a go, then you will have to become a club member and purchase a racing licence. You can use the Club Finder on Cycling Australia’s website. From here you just type in your postcode or town/suburb name and a list of the nearest cycling clubs will magically appear. What fitness level do I need to ride track? Anyone can ride track. You can go as fast or slow as you want. But if you want to race, you’ll need at least a basic fitness level. Track racing is short and sharp. It is more about high intensity than endurance, especially at club level. Rapid pulse rates, shortness of breath, exploding legs and the odd lung being coughed up are regular side effects of track cycling. Laughter and fun are too! One thing is certain, whatever your fitness level, it will definitely improve if you become a regular track cyclist. Aussie Matthew Glaetzer taking out gold in the match sprint event at the 2015 Track Cycling World Cup in Cambridge, New Zealand.